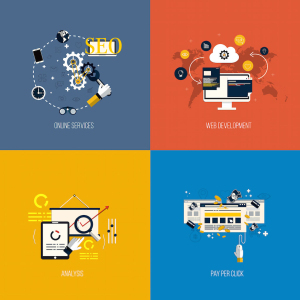 What is the best way to determine your website’s strength versus another site rather be a competitor or not? With so many tools on the web most people think because Google is the one selecting where your site and up in the SERPS that they must be the best place to actually figure out where your site places amongst the millions of other sites on the web. Some people unfortunately use it as a way to gauge a SEO campaign because Toolbar pagerank is different from Google’s internal PageRank the fact is when you check any tool that gives you a pagerank number you are not getting the same number that Google is using because toolbar or the page rank you and I can see using any tool is not the same as what Google’s Internal pagerank. (I know how dare they) So looking at the green bar simply does not update quickly nor does it have a real place in deciding whether or not your site is awesome in the eyes of Google or not so good. 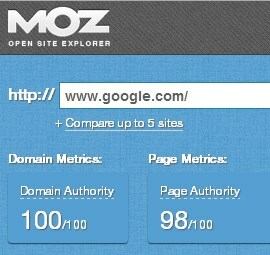 VS vs other tools like Ahrefs and Majestic SEO have their own ways of measuring website “Authority/success/ I made/my site is better than yours” really let’s just stick with authority. 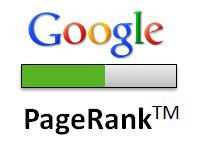 Most people will tell you Google PageRank. I do not agree with that and hopefully by the end of this you will not agree with using pagerank to judge a website or a unique web page itself. This video is just a small summary of success Wistia has brought to my clients. You will see that the video campaign highlighted for this client is our first significant test of Wistia. Blueprint Marketing (my firm) ended up getting over 18,000 views the first 20 days in addition to 49,200 views nine months later. By utilizing Wistia’s built-in site maps the method in which Google finds out what your video is about and ranks it using keywords you place in the video site map. Letting bloggers or journalists pull the video embed off of our site giving us a call to action on their site in addition to powerful links from high quality relevant domains via links already placed inside he shareable I-frame version of the Wistia super embed video kept on our domain. Wistia linking videos always link to the site we pick helps us immensely because everyone that shares that video links back to us. When somebody is done watching the video the call to action will take them back to our site, or they can just click on the link below the video that brings them right to our clients site, not YouTube. Mix in with built-in schema along with our ability to rank extremely high because when someone says that is a cool video take a look & sends it to a friend or any social media network are videos link back to the clients website not to YouTube. Wistia’s video platform makes an immense difference in rather not people have learned about what our client is selling. It ups the chance of them converting by an astounding number even better when people link to the video they do not link to YouTube.com they build them to garrisonbespoke.com this is a priceless asset. This video will show you the engagement rate and just how amazing Wistia is when compared to YouTube or Vimeo. You’re on either of those sites look and see how many people subscribe to the channel. Very few when even hundreds of thousands may watch the video it is not uncommon to get for subscriptions. By using YouTube or Vimeo your shooting yourself in the foot and building links to their domains instead of yours. When your embed a video on your website with YouTube you might have an excellent video furthermore people will share it but shared it directs visitors will go right to YouTube not to your domain where one person found it useful enough to share. That is why YouTube is useful for sending the entertainment to your friends, and that is about it is not a tool that you should use for your company website. In addition, YouTube and Vimeo offer the least amount of usability features of any of the primary hosted video solutions out there. The sitemap tells Google Bot what the video is about even if Google understands what a YouTube videos about do not correlate that with it being embedded on your website because it is embedded using I frame and Google Bot cannot see I-frame video embeds. By embedding YouTube / Vimeo on your site, your getting the worst of the world of web marketing. When subscription is worth far less than someone converting by signing up or clicking our call to action something utterly foreign in the YouTube & Vimeo products. When 78% of the people watching Wistia click the CTA at the end of the video or sign up for our newsletter via Wistia. It makes no sense to use anything else. We have just started video a weekly campaign for Garrison Bespoke that will feature answer questions people frequently want to know about made-to-measure suits and bespoke tailoring. By doing something for people looking to understand more about tailoring high-quality suits. They are more likely to link to our domain because were a resource for anyone in the market to purchase handmade bespoke, made-to-measure and customs suits niche. Most people that have not bought a suit that is fitted just for them want to know why it is a good idea for them to do that compared to buying something off the rack. By focusing on the entire industry not just talking about client but having the client talk about their industry. We can cast a very wide net combine that with the amount of high-quality unique content that comes from the person speaking during the video and transcribed that into an entire blog post. We drive people to the site that would have never known of us in the first place because are video ranks for their query that surrounds the client’s industry. By finding out what prospective clients want to know about your industry. Becoming a reliable source of high-quality information we not only help people, but expand our reach, increase brand recognition and show the customer they are dealing with people who are trustworthy, actual authority in their industry. I read that Peter Gabriel named his first three after himself. I thought of George foreman. The reason being George foreman named his five boys George and one girl Georgette. 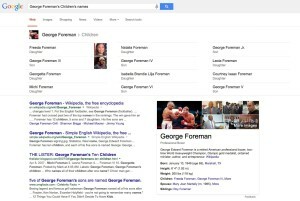 I ran a search query to verify if the girl was really named Georgetta this is what I came up with.